Adobe has incorporated seamless round-tripping workflows in most of its seasoned apps. Speedgrade is a new addition, and doesn’t enjoy the same fringe benefits. Yet, Speedgrade is hardly available as a standalone application, and it is mostly going to be paired with Adobe Premiere Pro. To a certain extent, Adobe has tried to ease the pain by defining a round-tripping workflow between Premiere Pro and Speedgrade. Import source footage into Speedgrade. Apply first-light color corrections if necessary. Render out proxies and import into Adobe Premiere Pro (more later). When your edit is locked, export an EDL. Import the EDL into Speedgrade. Conform the EDLs by loading the source reels as explained in Part Three. Color correct or grade the source files. Render out a file format, preferably DPX. Bring that into a finishing app for titling, etc. One could argue that the same workflow applies to any third-party application, so why should Speedgrade be given any preference? Unless you are limited by Adobe Creative Cloud, and don’t have access to other apps, it is hard to argue that Speedgrade offers the ultimate workflow. It doesn’t. 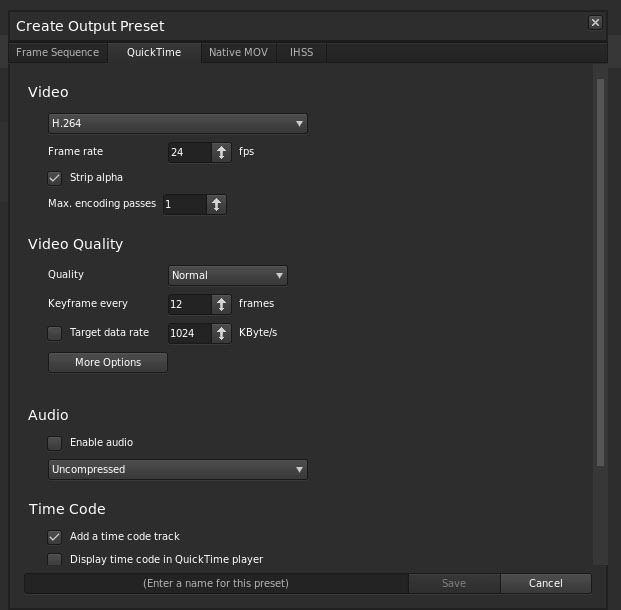 The Output section of the output tab (this is the second time Speedgrade has the same word for two things – the first being timeline) is where you choose the output file name and codec type. Why are there two ways to get to codecs? I can only assume a quick programming patch was used, just to get it to work. No point deliberating over it. It is what it is. The second section, Framing, allows you to choose whether you want to render proxies (low resolution files) or dailies/intermediaries (fancy words for export format). You can export from standard definition all the way to 4K (limit for proxies, perhaps? Otherwise there is no limit to resolution). The third section, Render, has a confusing second-guessing step. If we’ve already selected proxy in Framing, why do we need to tick Online Quality or Offline Quality again? According to the Speedgrade manual, it doesn’t make much of a difference, so you could choose either. Try a sample file using both settings, and go with what you think is best. When you export for best quality, the best bet is DPX or TIFF. I prefer TIFF. If you’re exporting for VFX, then you might want to consider OpenEXR. As far as output quality is concerned, the uncompressed options are all world class. The next step is to choose Source from the Time Code Source drop down. This ensures the proxies match the source footage. All you have to do next is choose your proxy format and hit Render. Note: Speedgrade makes no mention in its manual about the other metadata preset settings. I haven’t dared to use it, and I hope Adobe will release a more detailed manual with full explanations once they have revamped the entire app. Remember, in Part One, I asked that you tick the Autosave on under Settings? The session you are currently working on will be preserved even if you quit Speedgrade and return at a later time. You choose a name and destination, and save a .IRCP project file. To open the file, click the first icon in the above image, and that’s all there is. We’ve covered a lot of ground in this four-part crash course, and I hope I have clarified many things that should have been explained clearly in the manual. I hope this guide has cleared away a few misconceptions and given birth to some respect for Speedgrade. You see, it was, and is an industry powerhouse, and Adobe bought it for good reason. If and when the full integration and round-tripping with Premiere Pro and After Effects arrives, the others better watch out!